The Bosch Aquatak Clic 125 Pressure Washer is one of the most powerful pieces of garden machinery that will help to clean your garden features in an effortless way. This pressure washer will fire water and blast away the dirt from garden paths, drive ways, patios and other garden features. This pressure washer is powered by an 1800 watt, 125 bar engine that makes efficient use of the electricity to power the fan that fires the water up out of the lance. 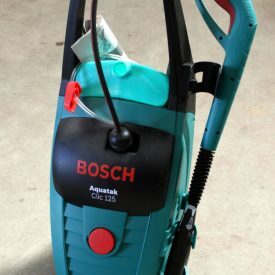 This lance has a 4 in 1 capability due to the added features included, while the auto hose and cable rewind make the Bosch Aquatak Clic 125 Pressure Washer easy and convenient to operate. The Bosch Aquatak Clic 125 Pressure Washer is mounted on strong and sturdy wheels and given it's light weight and handle, it is also extremely mobile around your garden.